NOW: Heather McAuliffe of the Fremont Historical Society, notes that the house abutting the sidewalks on the far left corner of the “then” survives in the “now” with an added story. This, she explains, most likely came with the 1908 regrade of the intersection. At about 10:20 on the Friday morning of August 21, 1903, a summer picnic in Woodland Park planned by the parishioners of Ballard’s Norwegian Danish Baptist Church was derailed by what that afternoon’s Seattle Time’s named “a boy’s meddlesomeness” without naming the boy. 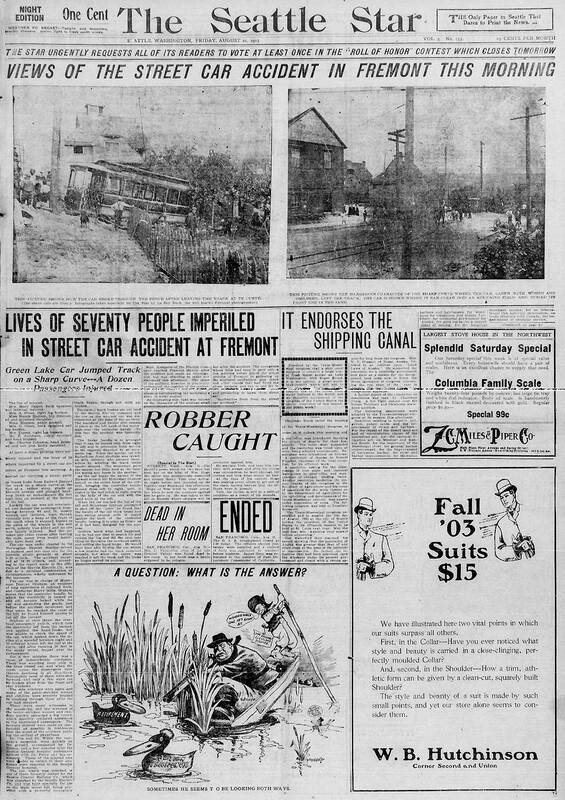 Front page for The Seattle Sun, Aug. 21, 1903 with news of the Edgewater/Fremont crash. To “standing room only,” the special but fated trolley was packed in Ballard mostly with women, children and their picnic baskets. 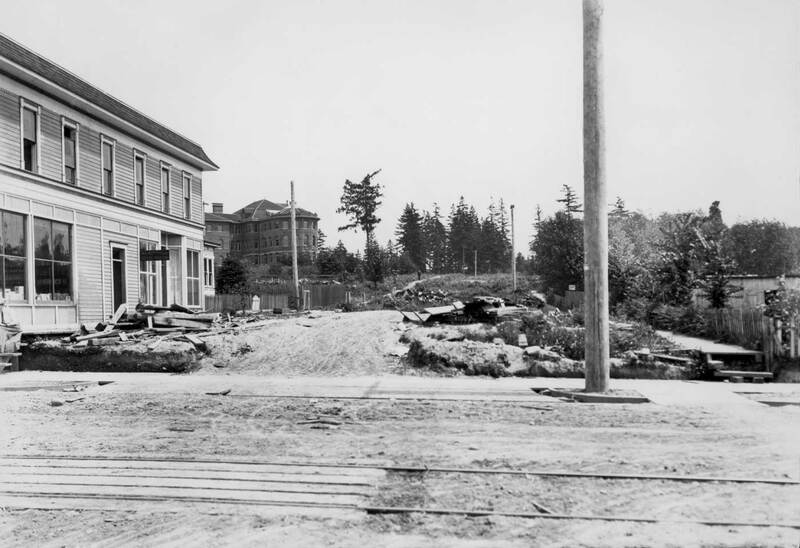 After crossing through downtown Fremont and climbing east up Blewett Street (now N. 35th) under full power, the car crossed thru Aurora Ave. and begin its unrestrained descent to what was ordinarily a sharp but negotiable left turn on to Albion Way. This time, however, the trolley’s “controller handle” had locked up with the brake handle, with which the “meddlesome boy” had been playing. 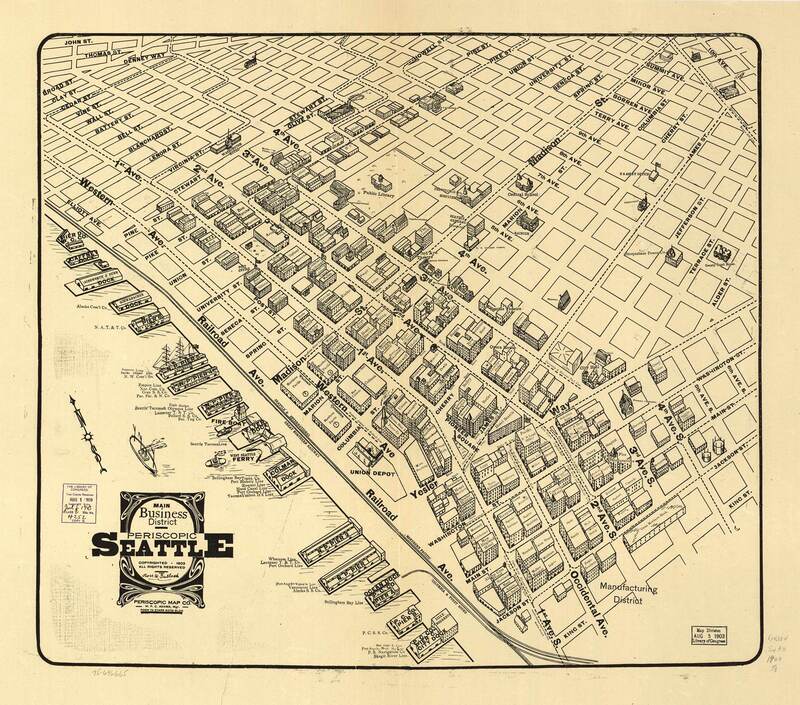 Our stock 1912 Baist Map is again helpful, but also 9 years later somewhat misleading. The unmarked street between Ewing (34th St.) and Kilbourne (36th St.) is the Blewett (35th St.) that figures in this feature. The Noble Hospital noted in the map between Albion and Woodland Park Ave is still a private mansion in 1903. We feature a sketch of it below, and a advertisement for it near the bottom, but with a different name: Keeley. The mansion at 3515 Woodland Park Ave., its south and east facades as seen from Woodland Park Ave. ABOVE: Looking north up Albion from 36th in 1952. 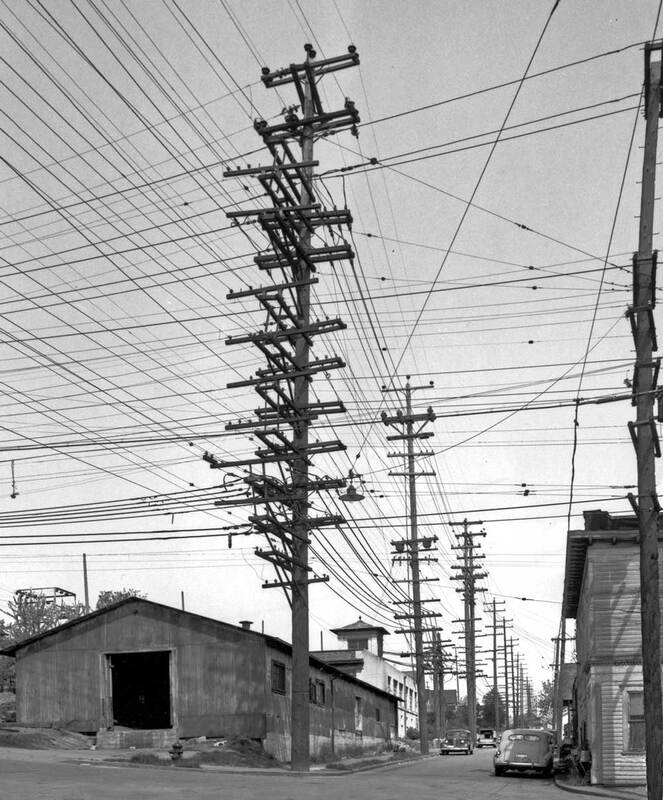 The competing power poles for Seattle City Light and Puget Power were still an ungainly feature of Seattle neighborhoods. 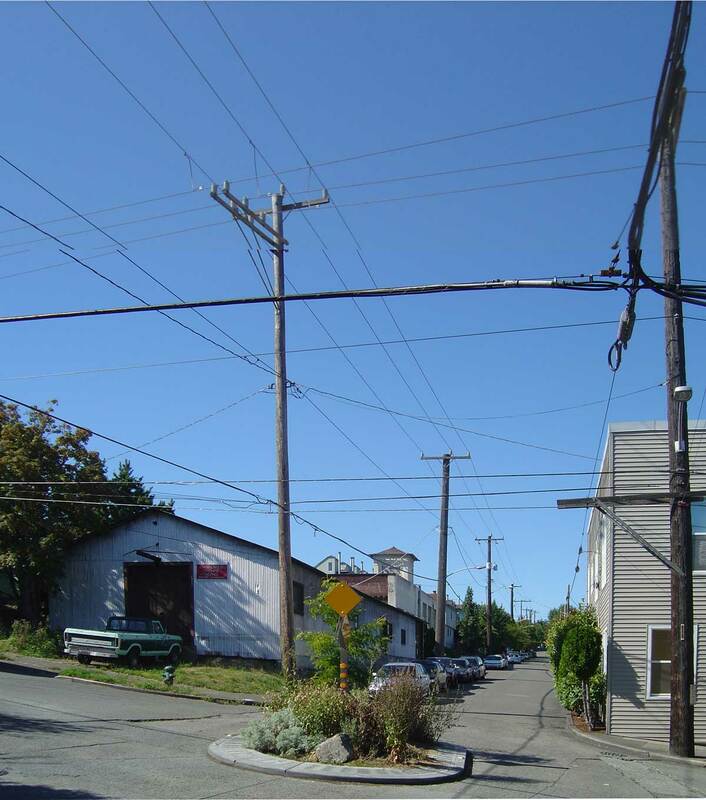 BELOW: The same but recent prospect on Albion north from 36th St. 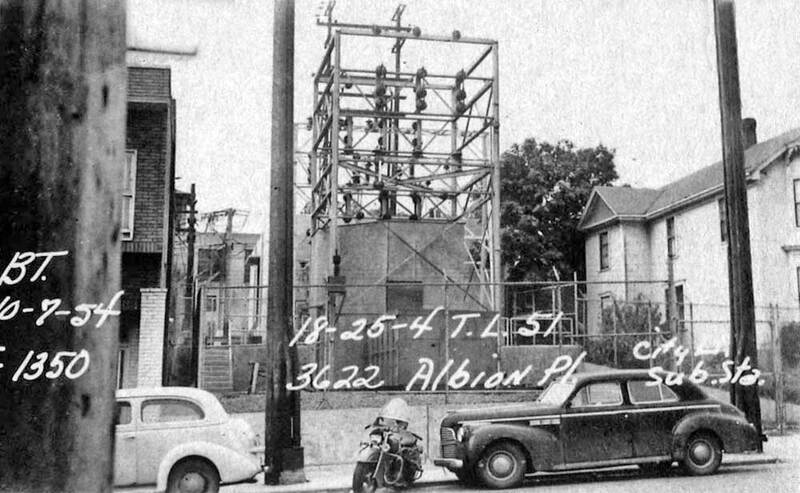 Note the surviving tower from the old City Light sub-station. Well into the long block on Albion north of 36th a glimpse of Seattle City Lights substation at 3622 Albion Place. Instead of turning at Albion, the speeding trolley then jumped the curving track seen at the center of Buck’s photo, and “plunged down an embankment” into an orchard. The about 62 passengers plunged as well to the buried front end of the car crying out like a broken accordion. Several were hurt badly. One, 80-year-old Maren Eggan, was still in the hospital in September. 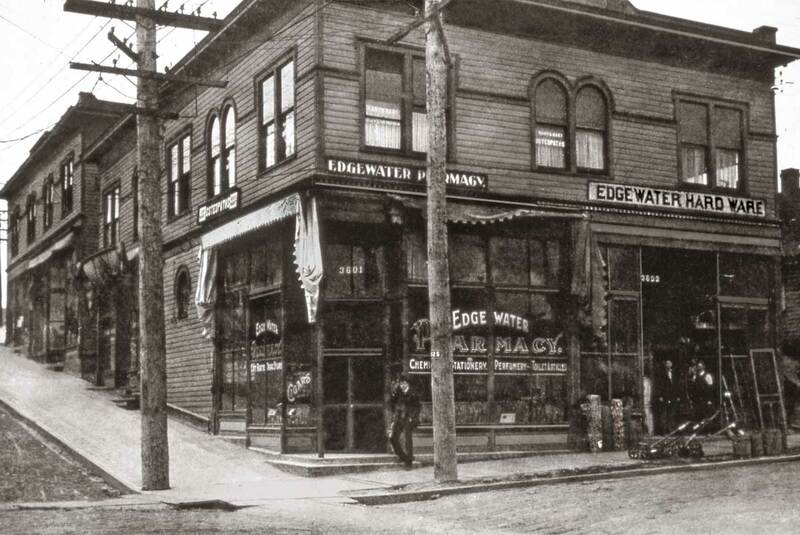 The Edgewater pharmacy and business center at 36th Street and Woodland Park Ave. then, ca. 1912. Same corner – Edgewater Hardware in 1950. Courtesy, Washington State Archive, regional branch – a Tax Photo. Edgewater business block “now” – really, recently. 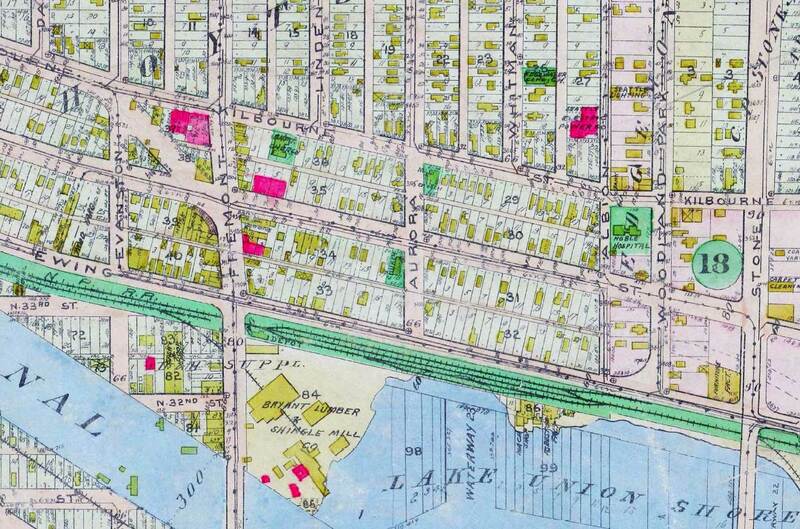 Edgewater Addition map from the 1889 and signed by STONE of Stone Way. Anything to add, Paul? 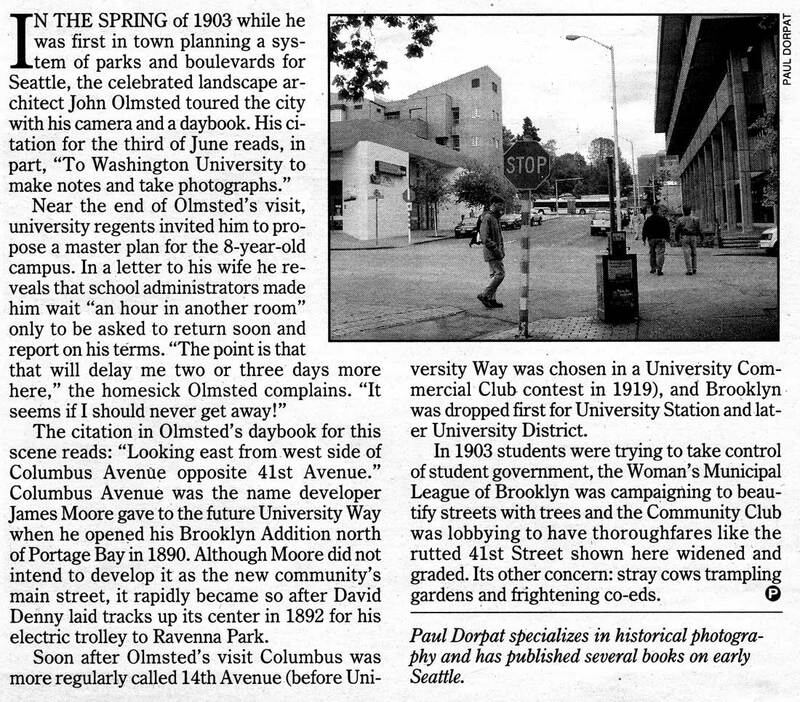 Yes Jean, and we shall start with two Edge Links (attached by Ron Edge sometimes known here for his Edge Clippings) that are relevant to the Edgewater neighborhood and/or to trolley wrecks – lots of them. In this line I am also reminded of the Edgewater Eiffel Tour, a tragicomic episode in North End Life that naturally leads to Paris and the real thing. 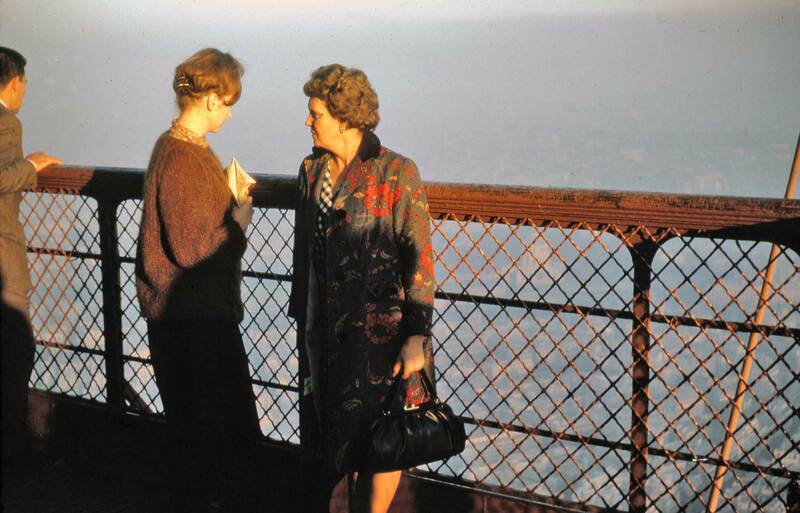 During our French visit you – Jean – will share some tour pictures with use and perhaps of our Blogbuddy Berangere as well. 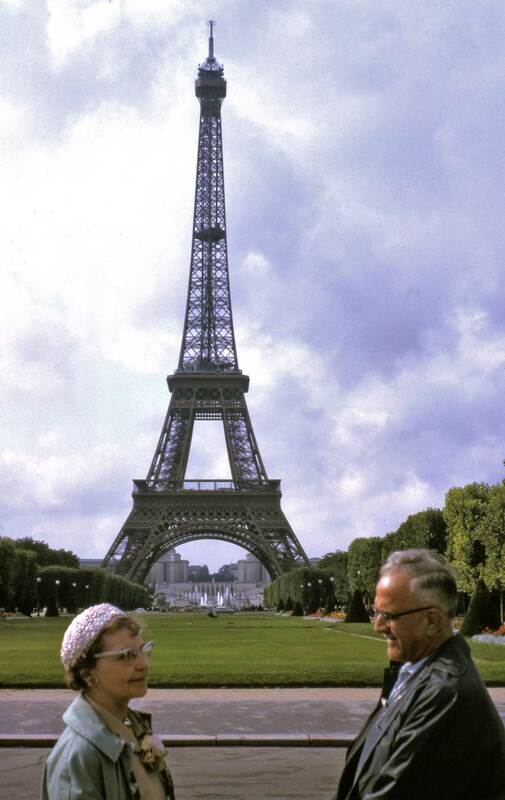 Closer to home, if I can find it I’ll attach a mid-1960s slide of parents Cherry and Ted Dorpat standing in profile with the famous French tower. I show devotion to my parents and put them up first. 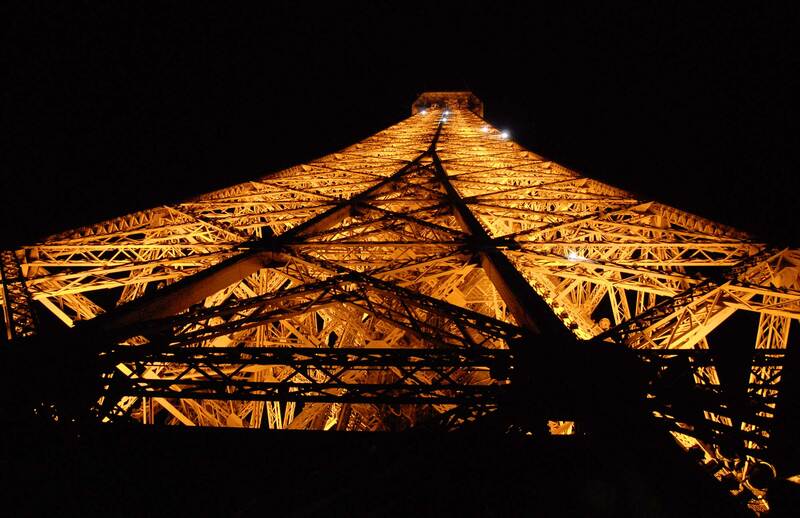 You follow with your own Eiffel Tour photos – and Berangere’s – and I’ll conclude the Tour part of this post with the short story – behaving like a fable – of La Tour Eiffel Edgewater. And we might find a few things more to add Jean, like other evidences of our city in 1903. But only a few for we are behind in our commitment to write an introductory essay for Historic Seattle’s up-coming book on First Hill. This Jean reminds me to remind our blog consumers that you and I will be giving a lecture on First Hill history at TOWN HALL late this month. Do you have the details, and will you share them? I do indeed Paul. We will be lecturing at Town Hall on June 25th at 7:30 in the evening. Here’s the link! Cherry and Ted Dorpat in Paris and in profile, ca. 1965. Still Jean here. I’ll set and match with a photo of my own mother just a couple years prior. 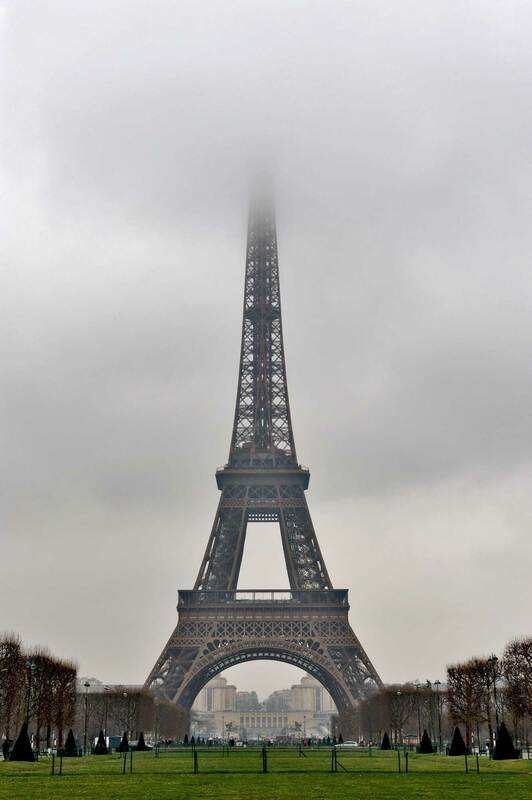 I’m also reminded of our blog partner Berangere Lomont’s remarkable photo of the Eiffel Tower disappearing into the clouds, part of our MOHAI Now and Then exhibit from 2011. And, just for fun, let me toss in a few thumbnails of my own views of and from that evocative edifice, each of which may be clicked to enlarge. 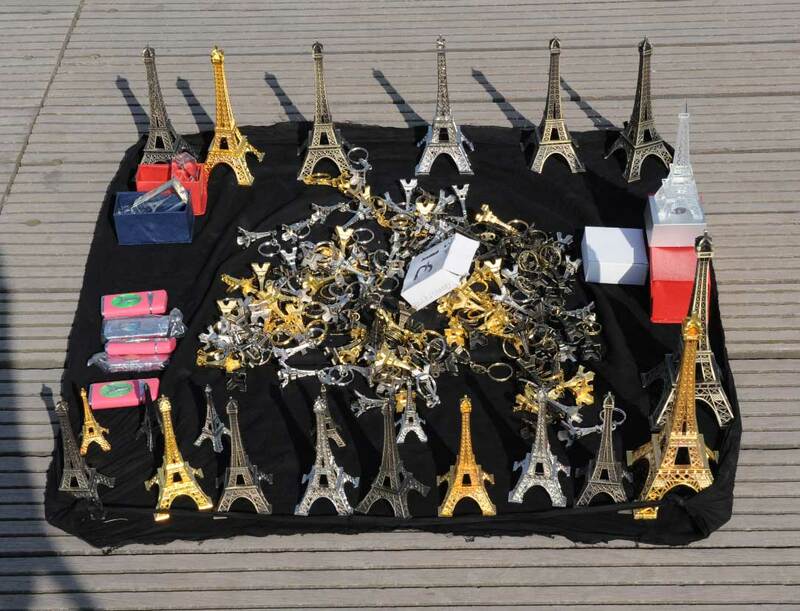 Un jour, l’histoire de la Tour Eiffel Edgewater sera recontee! Now in a time when such muddles are often brought forward and trumpeted on television with the hope of shaming something or someone, this hidden story was also bound to rebound, and here you have it. We share it for we cannot imagine why anyone should now feel any shame. Still we can at least wonder if any members of the Fremont Historical Society may care to exploit this history. 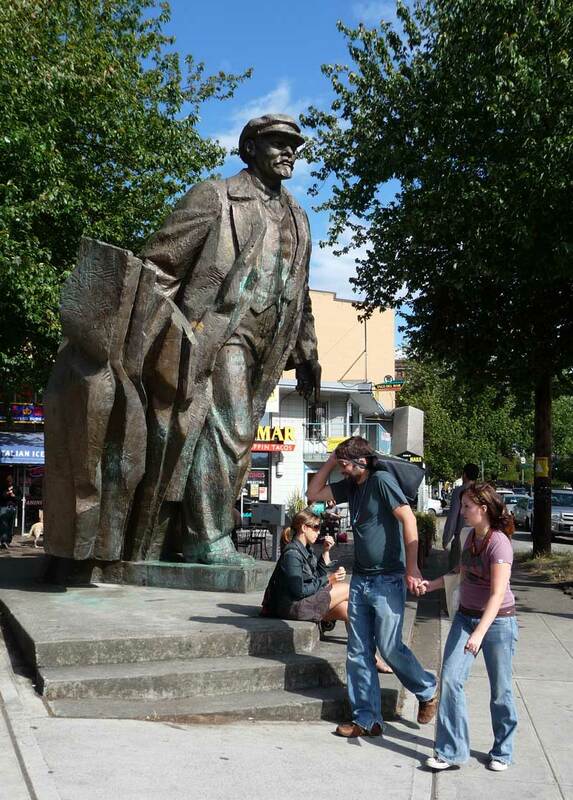 Fremont’s own “tower” of European birth: Lenin. 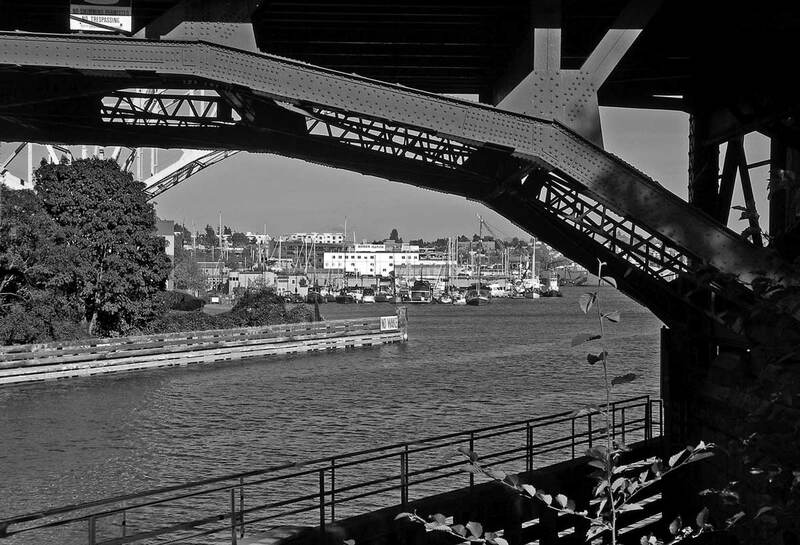 The photograph below of the nearly near Aurora Bridge was sent along by a concerned person who, for reasons we will not question, wishes to be kept anonymous. 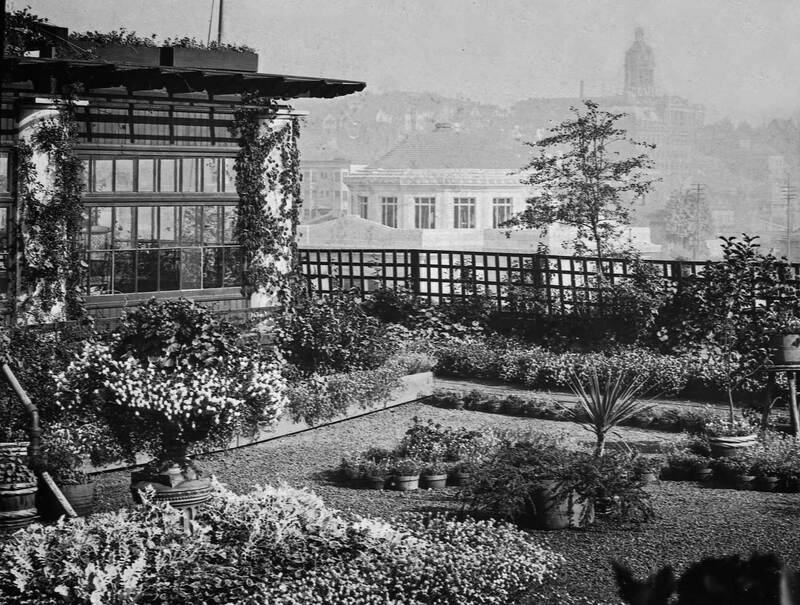 They did indicate, however, that before sharing the lantern slide they had attempted to find any surviving members of the club introduced below but without success. They concluded, “Go ahead. I’m sure it will be alright.” Such confidence is comforting. Long ago during an after school treat of cornbread and Ovaltine around the Cornbell family’s kitchen table, Fremont Chamber of Commerce Toastmaster Wally Cornbell’s mother told us, “Some day the story of the Edgewater Tower will be told.” Wally’s mother continue, “But never mind.” We were, she explained, just a few years too young to understand. 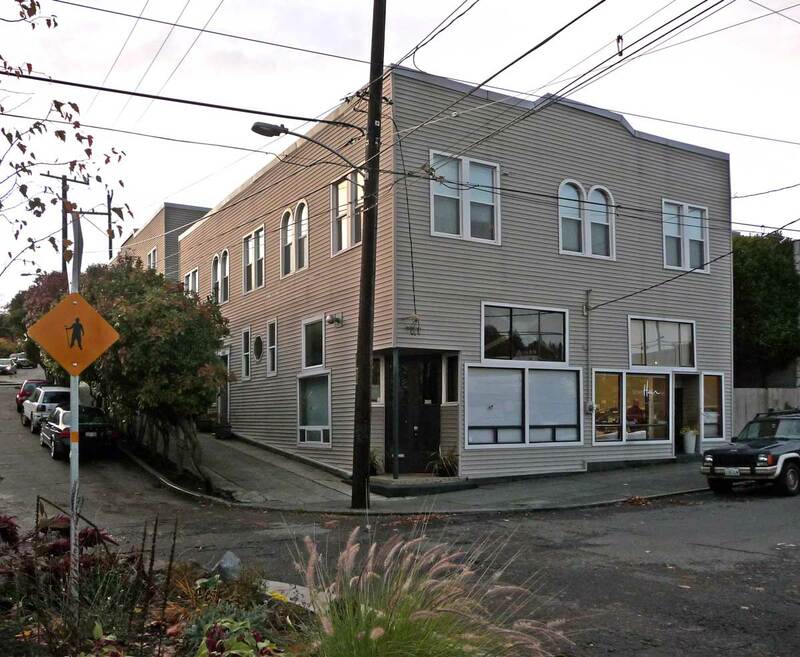 The Cornbell’s lived on Whitman Avenue in the Seattle neighborhood of Edgewater, although some now claim it all for Fremont, others divide it between Fremont and Wallingford. 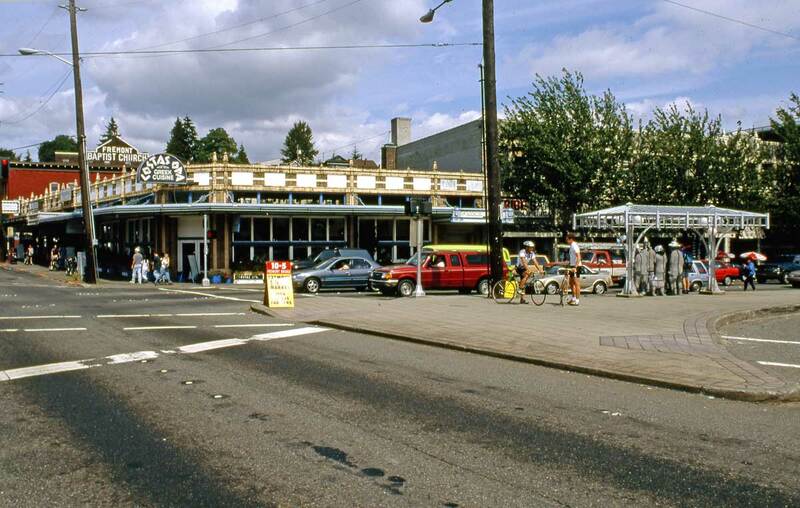 Like both Fremont and Wallingford the Edgewater community was never incorporated into or unto itself. 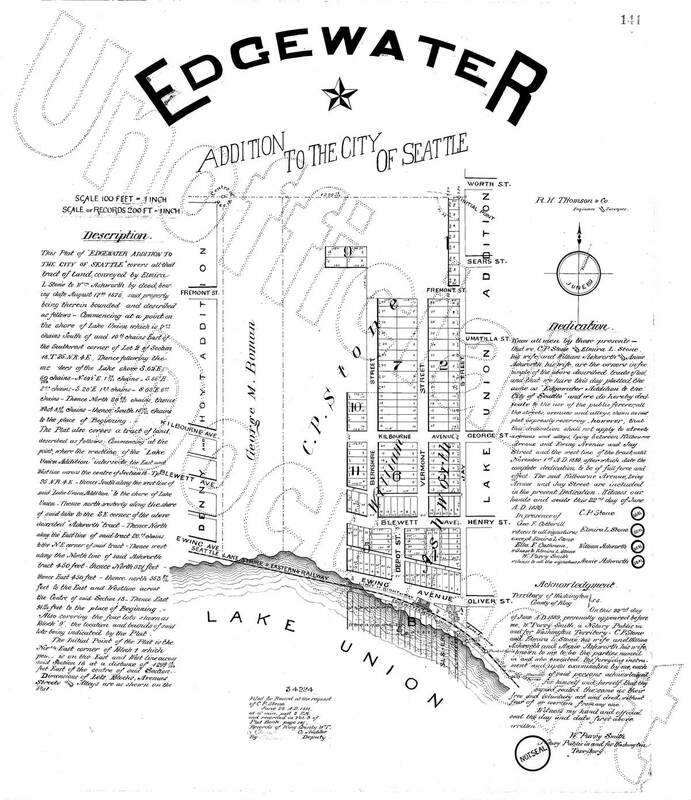 Edgewater got a lot of recognition on maps, and for a while had its own railroad station on the Seattle Lake Shore and Eastern line, still it never reached the reputation of its neighbors. 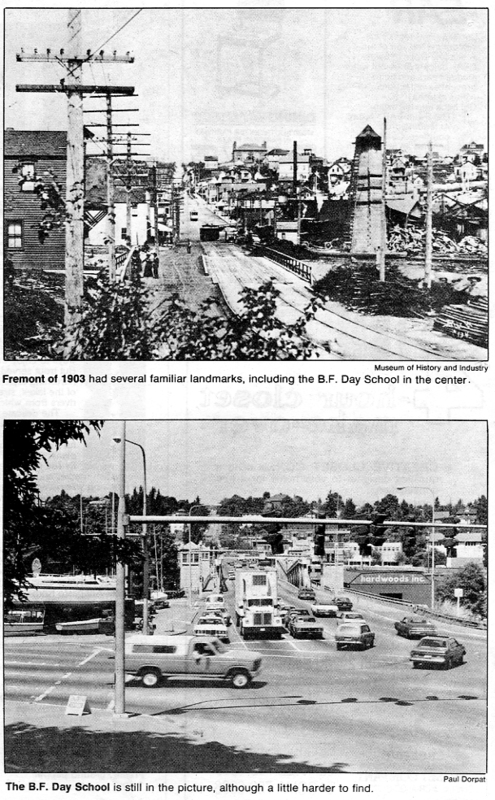 By the time the Aurora Bridge was completed in 1932 any sense of a boundary between the east portion of Fremont and the west of Edgewater had blurred and the trend indicated that eventually Edgewater would either slip beneath the eastward tide of Fremont, or from the other direction, the somewhat later push of the Wallingford neighborhood west into Fremont would also overtake it. This record of the new Aurora Bridge – with the wrought iron (really wood painted flat black) tower beyond – it is a treat. 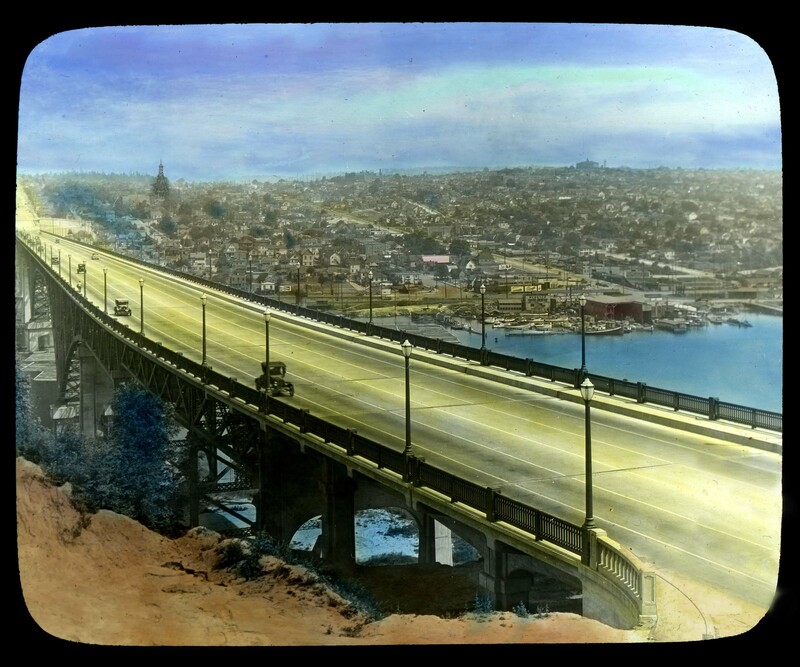 The rare lantern slide looks north from Queen Anne Hill over the nearly new Aurora Bridge to the north side neighborhoods of Edgewater on the left and Wallingford on the right. The building holding to the horizon on the right is the Good Shepherd Center. The short-lived de l’Edgewater Eiffel la Tour can be seen just breaking the horizon on the left. At some point this lantern slide was hand-colored, as was often the custom, but not with care. The blue area below the bridge while meant to depict the ship canal is actually still south of that waterway’s south shore. It should have been given an earth color. 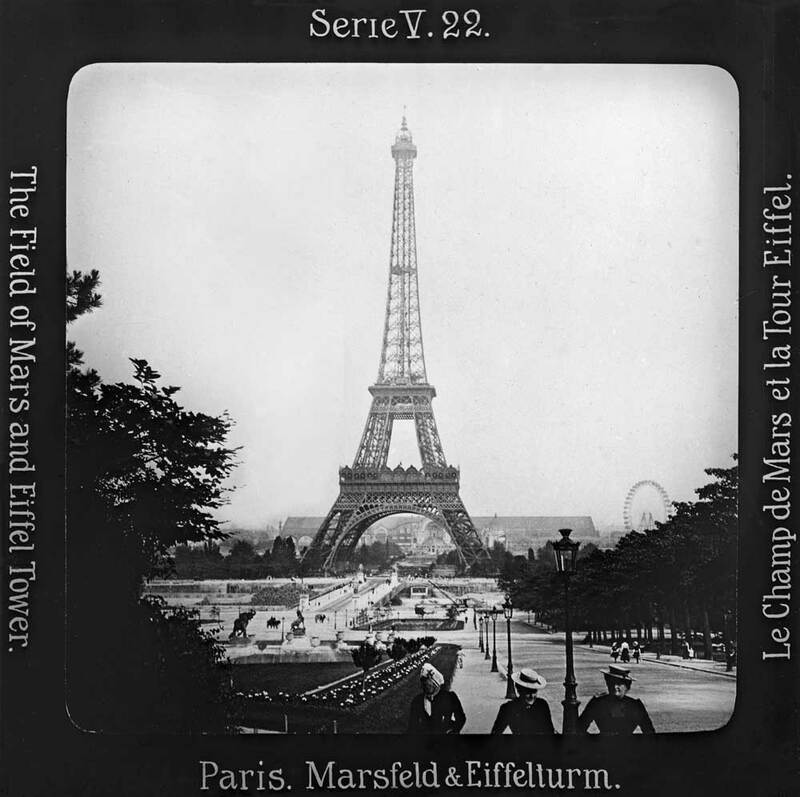 Otherwise we have been assured by our private donor that no retouching has been done to the antiquarian lantern slide. Fremont is out of frame to the left. 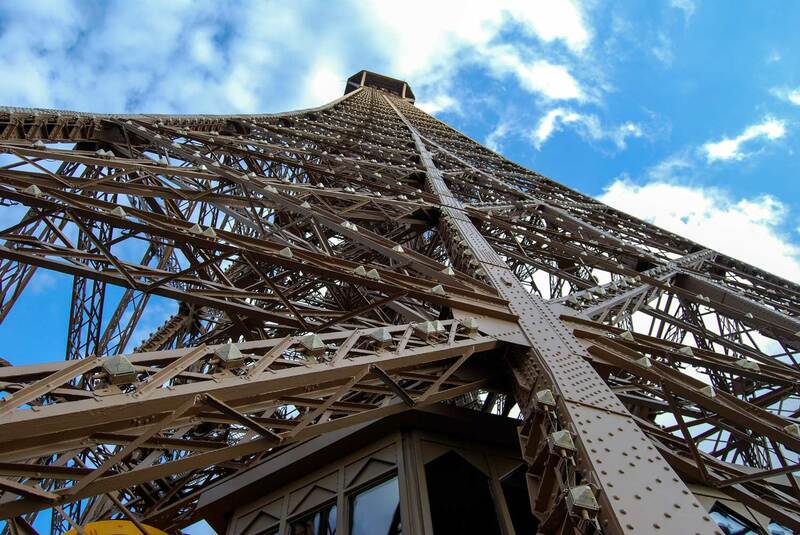 Did you know that the Edgewater Eiffel Tour was built to one-tenth size of the original in Paris? 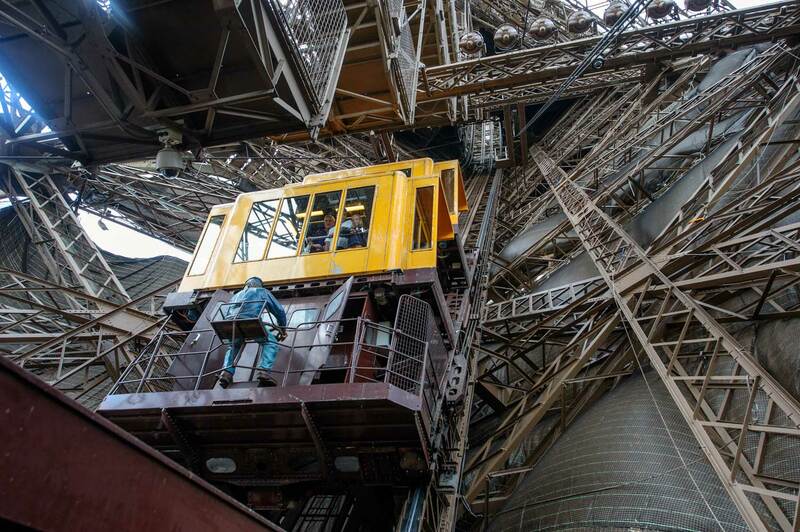 It reached more than 106 feet high! By comparison this made it only ten feet shorter than the Sixth and Pine Building at Sixth and Pine. 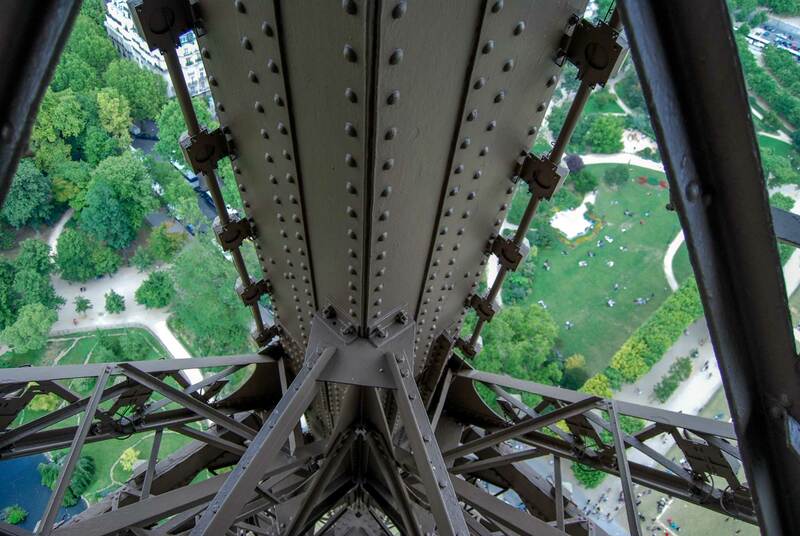 It was intended that from the top of la Tour Edgewater Eiffel you could see something in all directions including Ballard to the west in spite of Fremont being in the way. Berangere’s capture of these small towers plays with their shadows. Since Stone Way, ran north and south along the trough of a small watershed that got contributions from both Wallingford and Fremont it seemed most likely that Stone Way would be eventually identified as the border between the two neighborhoods and that then Edgewater would be forgotten. The Stone Way division was, however, confused by the construction of the Pacific Coast Limited Access Speedway north from the new bridge on Aurora. It was an artificial border, but a handy one. The story of what followed had considerable effect on these questions of neighborhood identity and on the ultimate fate of Edgewater. Another Seattle tower obscured by an atmosphere that mixed the mists of Elliott Bay with contributions from the great loads of coal warming its buildings and generating electricity. Here the First Hill tower of the King Count Courthouse is dimly seen from the roof garden of the Lincoln Hotel at the northwest corner of 4th Avenue and Madison Street. 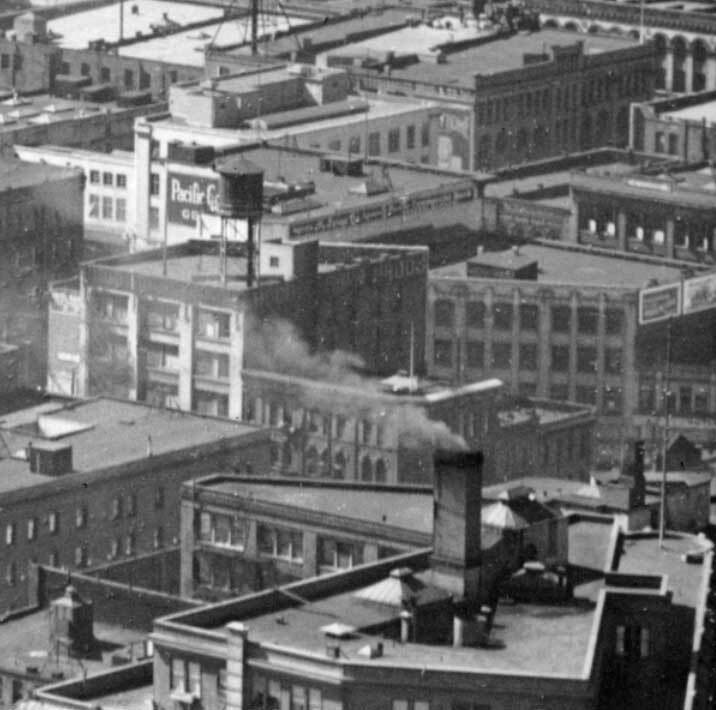 The hotel was destroyed by fire in 1920 and the court house razed by dynamite in 1930. 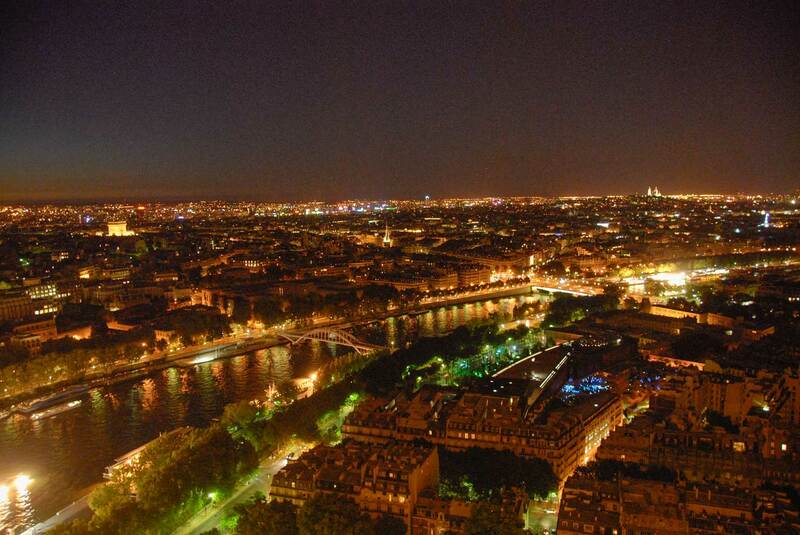 As you may know, in 1933, the Eiffel Tower celebrated its 50th anniversary for the 1889 Centennial of the French Revolution. It was a few years early. The early scheduling took advantage of the cheap construction costs of the Great Depression that touched the French economy as much as ours. 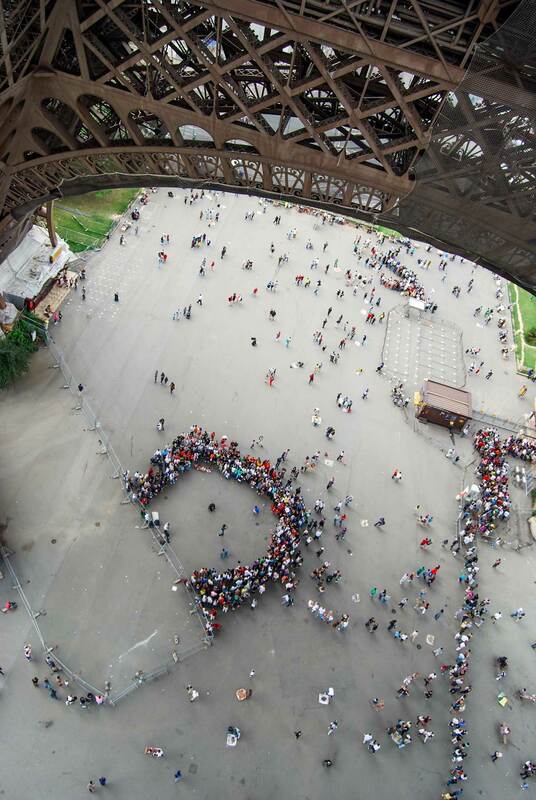 Worldwide French Societies were encouraged to fall in line early and do something to celebrate the building of the Eiffel Tower, which was dedicated in 1889. Here in Seattle the Edgewaterian Eiffelers were the only local group at all prepared and they were encouraged to take the lead by the local French consul. 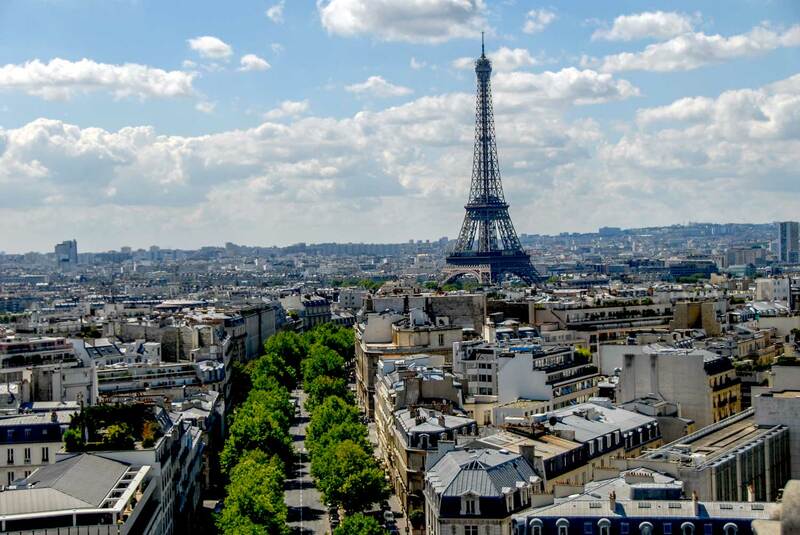 The club was originally formed and continued to take encouragement from the fact that like the Eiffel Tower in Paris rising high above fleuve de Seine, their neighborhood stood beside a great waterway, the Lake Washington Ship Canal. 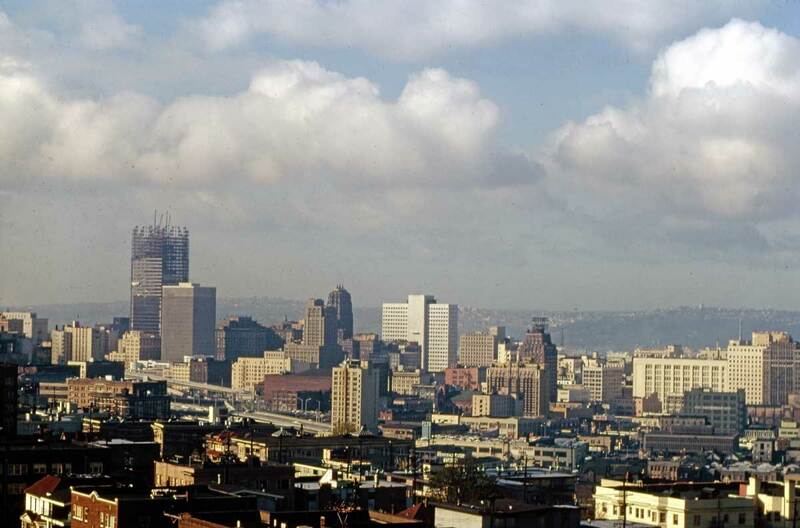 The SeaFirst Tower under construction in 1967/68. Photo by Robert Bradley. 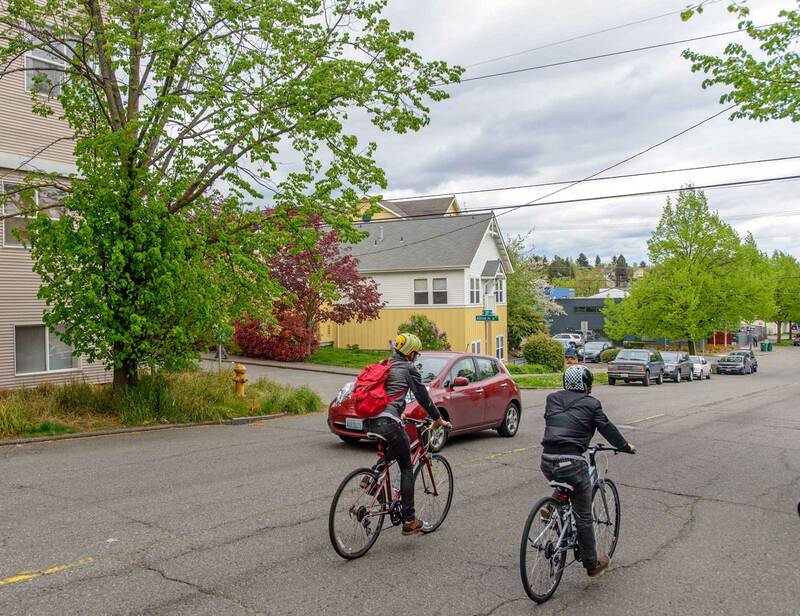 The French Clubs of the nearby Wallingford, and Green Lake neighborhoods were ready to help and happy to follow the Edgewater lead. Similarly, the French Department of the University of Washington was pleased to be included in this endeavor of mixed patriotism. They helped with translations. 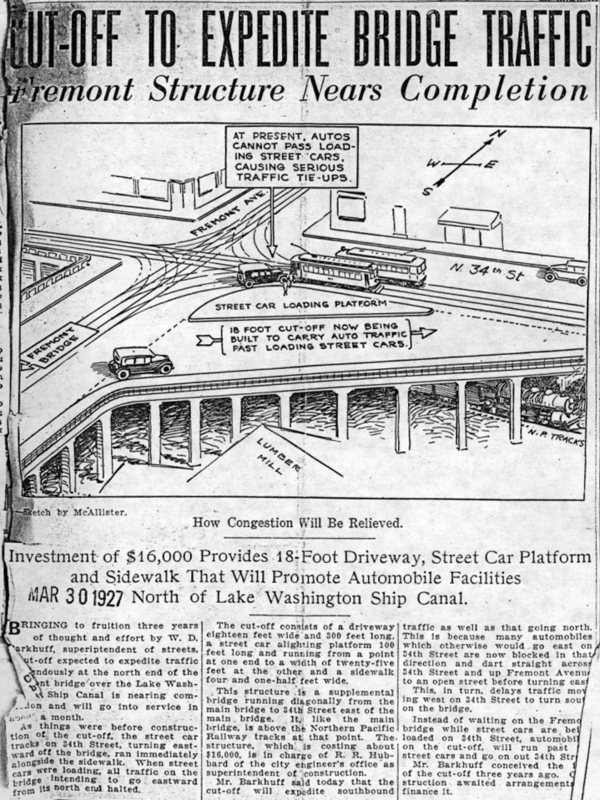 Only Fremont residents were cool to the idea, for they were generally not willing to recognize the legitimacy of Edgewater as a neighborhood not enfolded in their own, and with the 1933 construction of the Aurora Avenue north approach to the new bridge these anxious concerns were heightened for, as noted, the new highway effectively created a new border. Unknown to most, Seattle has evocative rooftops that are not effecting from the street. Here two flatirons help “misshape” the Pioneer Square neighborhood. What are they? 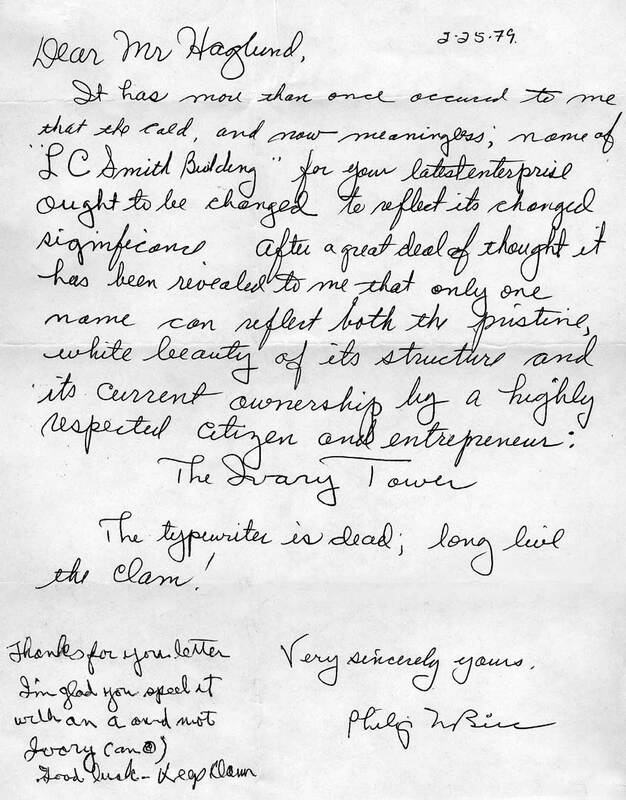 It is safe to say that the Edgewater tower would have been celebrated from Seattle to the Seven Arrodissement were it not for an unfortunate turn in events. A combination of haste, cheap labor, and liters of drinkable free champagne contributed by the local French consulate resulted in shoddy work and la Tour started to collapse soon after it was topped off. 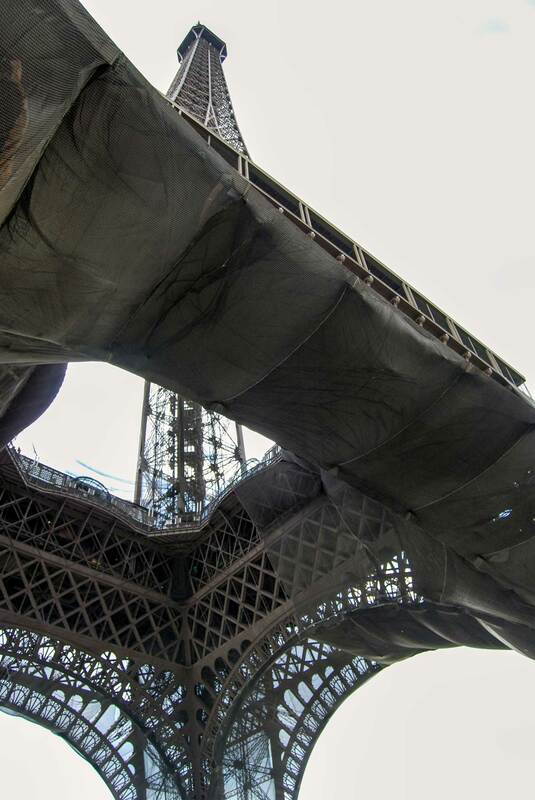 Rather than risk dismantling its uncertain parts, de l’Edgewater Eiffel la Tour was torched after neighboring homes were first covered with wet sheets and traffic was stopped on the new Aurora Speedway for the duration. Understandably feelings for the French dipped some after the fire. It was also the end of the Edgewater club and perhaps of the identifiable neighborhood. Certainly, one did not hear much about Edgewater or Edgewaterians after this unfortunate turn of events. The fated memorial was an embarrassment and forgotten except for spontaneous although guarded references like that from Wallace’s mother, Mrs. Cornbell. But now is later and, at last, the story is told – a matter of record. 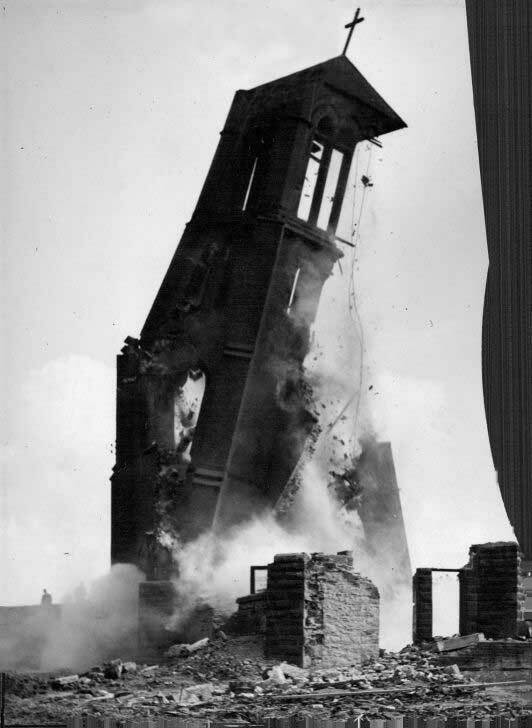 1929 – another Seattle tower willfully disposed for flat designs, here on Denny Hill – the Immaculate Catholics at 6th and Bell. The north shore of Lake Union ca. 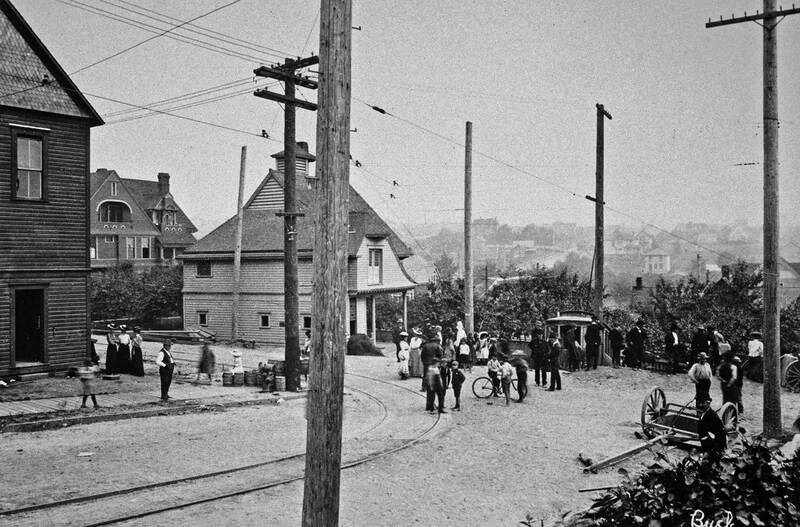 1899 with no note yet of Wallingford and the University District still named Brooklyn. 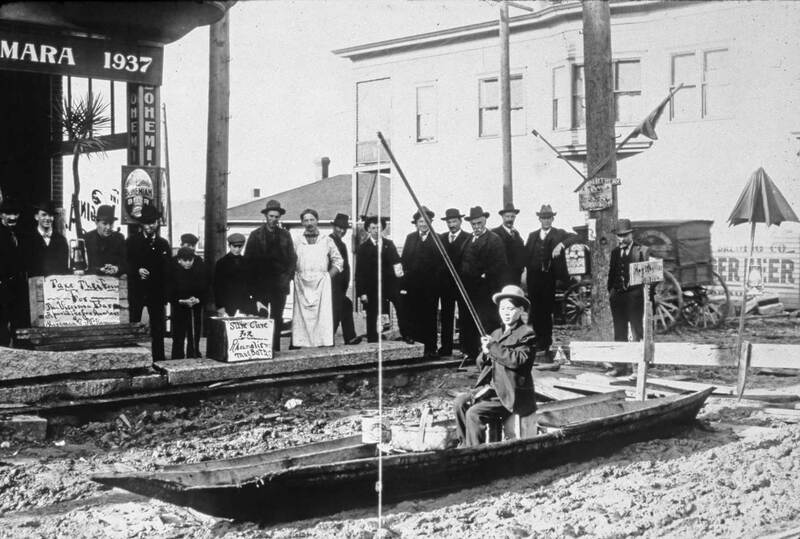 The year of the Fremont derailing, and more. We have pulled a few photographs of events from 1903 for illustration here with short captions. Green Lake panorama – and not complete. A third part, far left, of Wallingford is not included. This looks west across the lake to Phinney Ridge in 1903 and so a few years before the lake was lowered and this east bay largely filled in for a recreation field and field house. Today, Interstate-5 crosses directly across the front of this scene. The Olympic Mountains are on the center horizon. (Courtesy Washington State Museum, Tacoma. Photo by A. Curtis.) DOUBLE CLICK to enlarge. 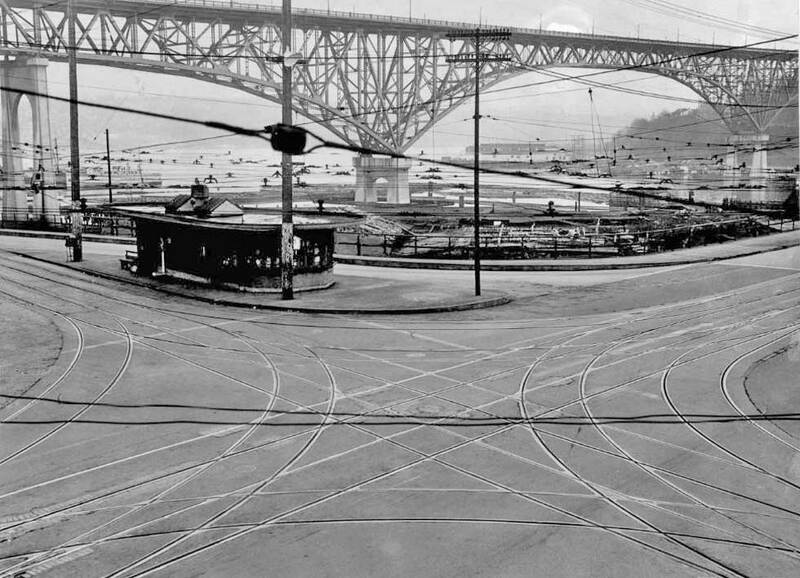 Pier 5 – now 56 – waits for the 1903 arrival of Theo Roosevelt on the waterfront. 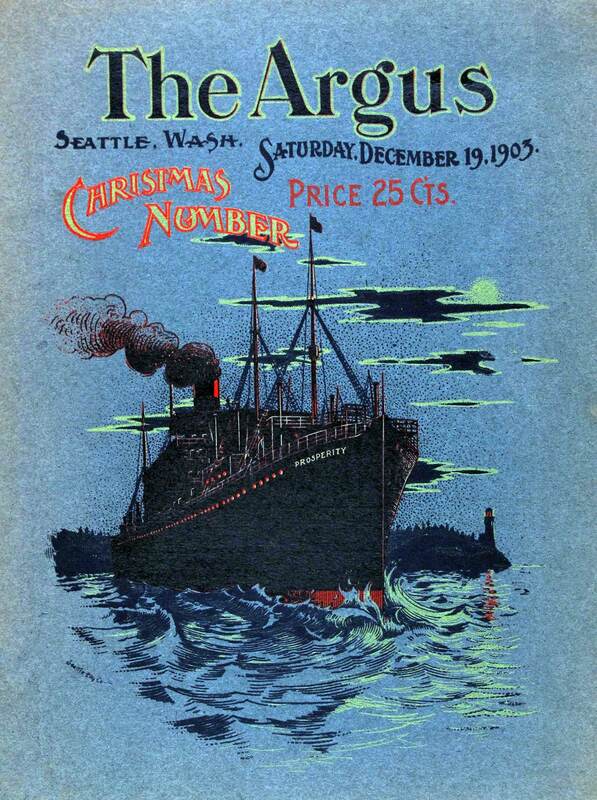 Not for Seattle alone, but perhaps for all their touring stops in 1903. 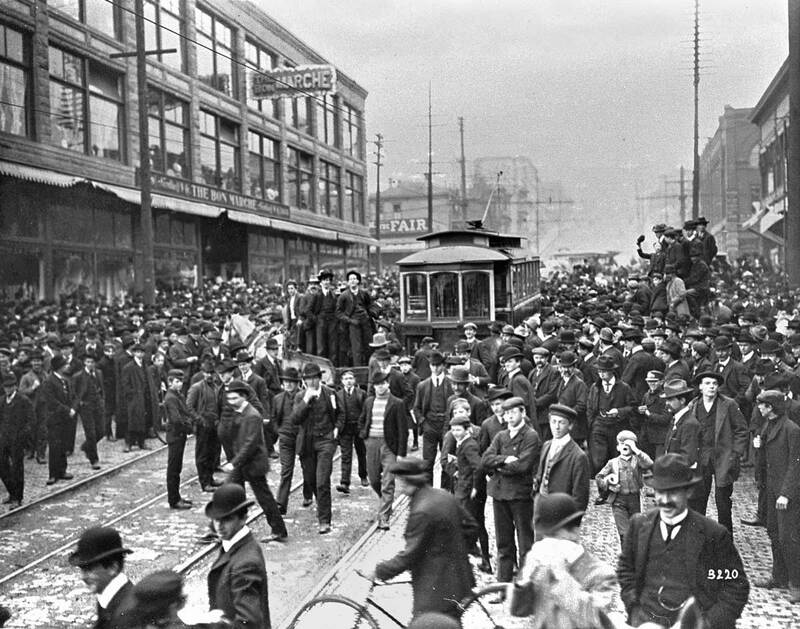 A staged protest over street conditions at the intersection of Virginia Street and First Avenue in the spring of 1903. The imminent arrival of Pres.T. 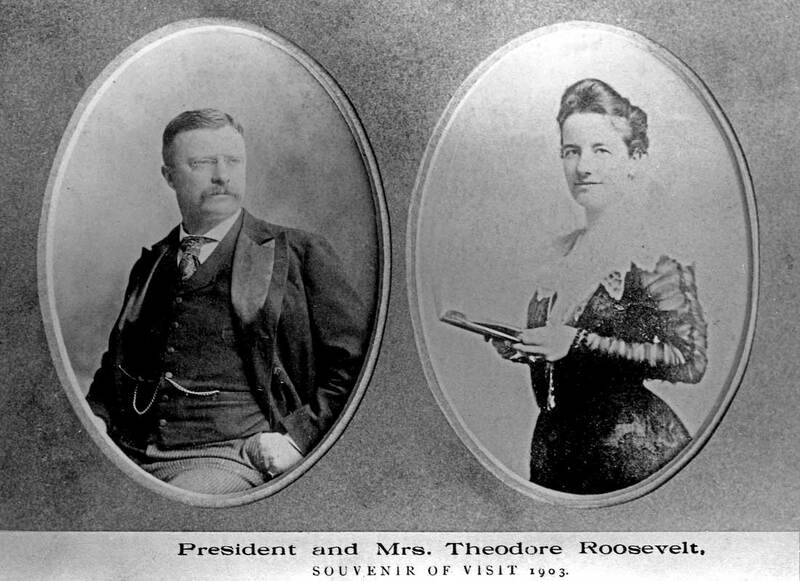 Roosevelt was part of the shaming pitch. 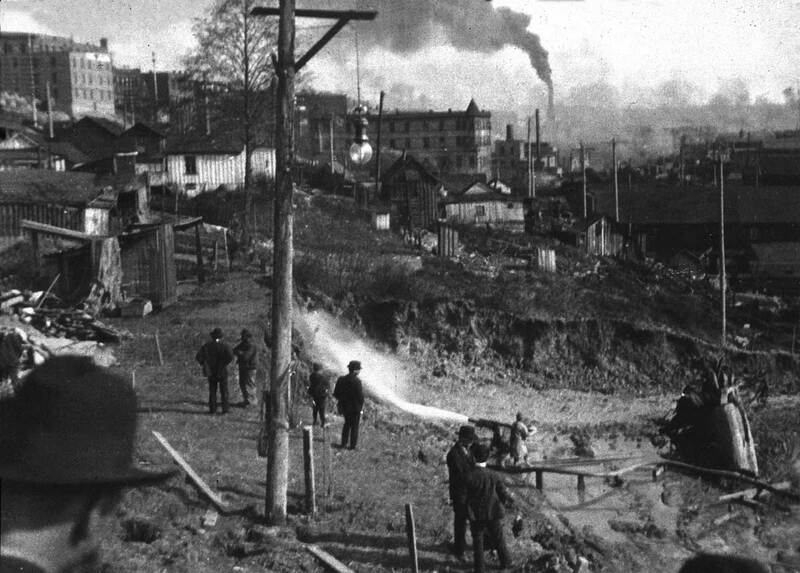 Eroding the waterfront bluff north of Virginia Street to begin work in 1903 on the railroad tunnel beneath the city, which was completed in 1905. Looking east across University Way on N.E. 41st Street in 1903 to a nearly new Science Hall (Parrington Hall) left-of-center, on campus. The frame building on the left was razed in memory, I mean I remember it from the late 60s as the home of a guitar shop, and not a chain but a storefront for a skilled guitar “doctor.” This is an Olmsted photo done by the firm for their visit here to design the city’s park system – and much else. This was used in Pacific, and following below is the text. The first appeared in Pacific on July 1, 2001. The Argus was a long-lived political/cultural journal that only stopped publishing “recently,” which means that I remember it and read it, although I never wrote for it. On top a panorama of Fremont and Phinney Ridge from Queen Anne, and at the bottom another looking northwest into Ballard. 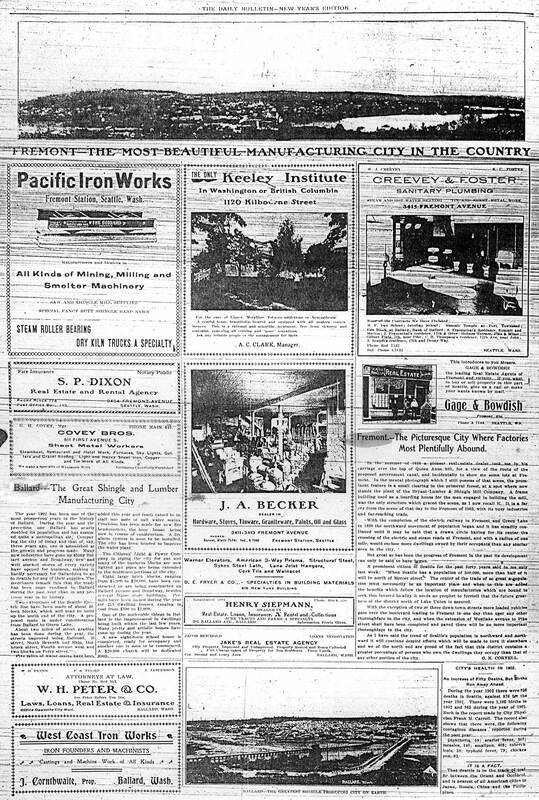 An advertisement for the Keeley Institute runs centered below the Fremont pan. The Instituted was on Woodland Park Avenue. 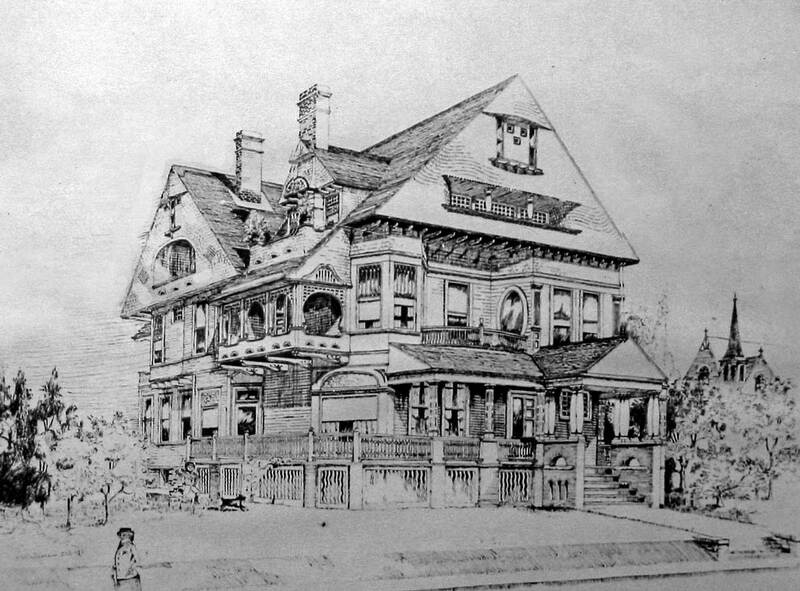 The grand home it took over appears far above in the main photo – from the Star – and also in a sketch below it. 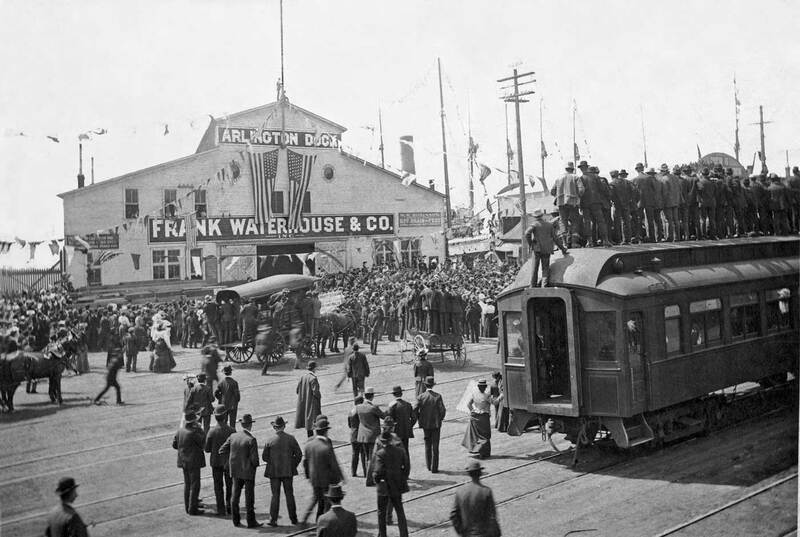 Scene from the 1903 trolley strike. 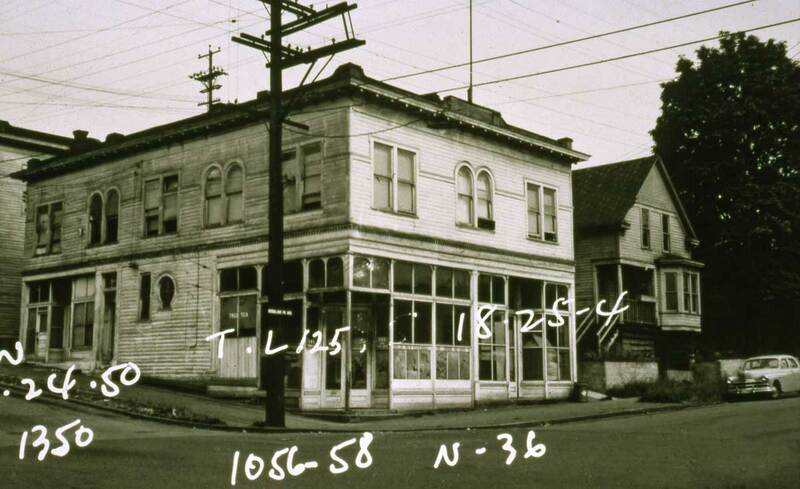 The Bon Marche was then located at the southwest corner of Second Ave. and Pike Street. So this looks north on Second from near Union. 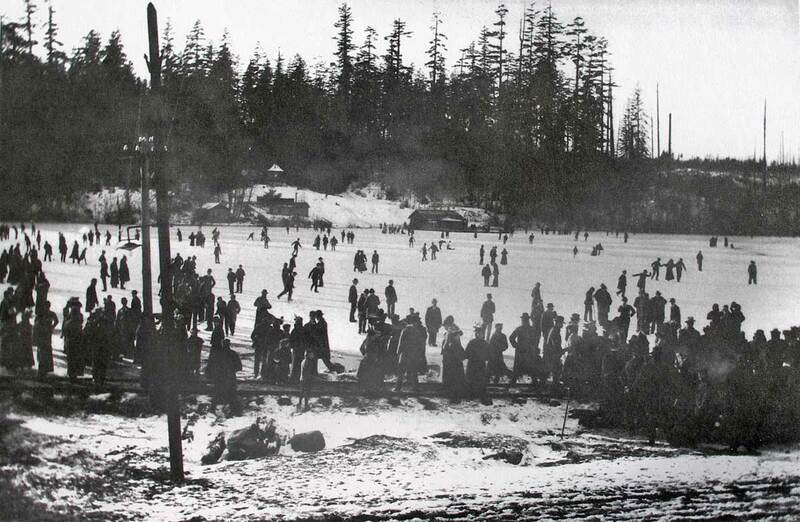 Skating on Green Lake in 1903. The forest on the far shore is part of Woodland Park, the destination this year – in the summer – for the Baptists that were squeezed, and some of them mangled, in the run-away street car on 35th Street at Albion Pl. 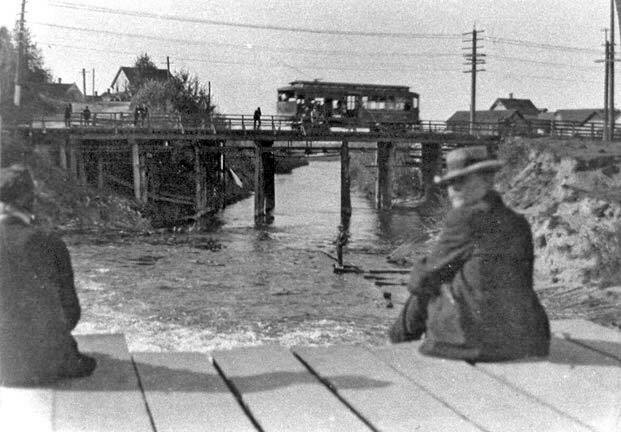 Looking north into Fremont across the Fremont “low-bridge” in 1903. 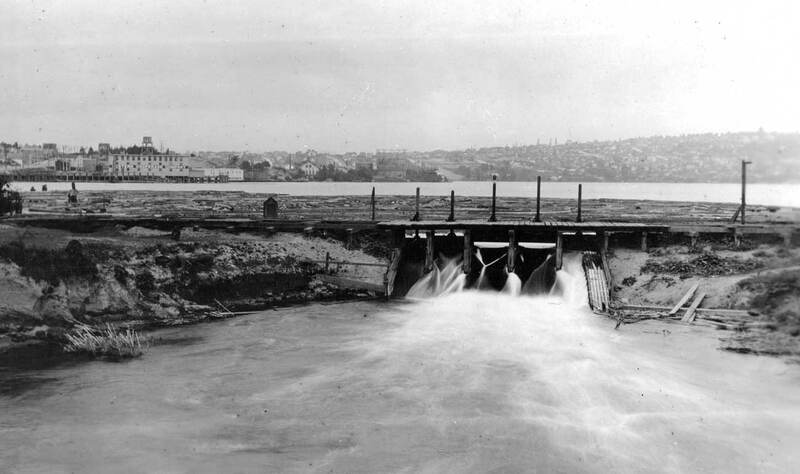 The Fremont dam broke in 1903. This view of work on the dam and flume is dated 1903, and so most likely after the break. 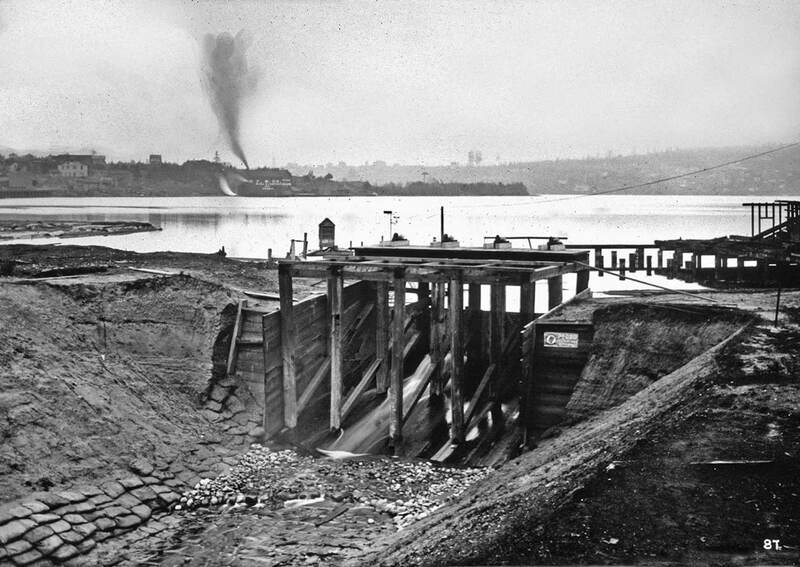 In some chronologies 1903 is the year that work began – haltingly – on construction of the Lake Washington Ship Canal. Note there is as yet no Gasworks (1907) in the picture. A “now” for what is above it. 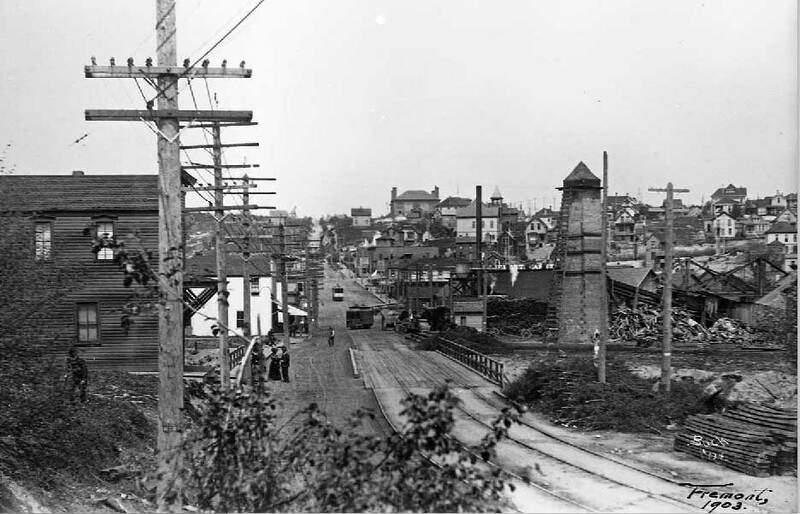 Four years later, looking east from the Fremont (still) low bridge to the dam and flume in 1907. Here work has begun on the Gas Works, at the center. From the bridge over the dam-flume, looking west at the Fremont low bridge. 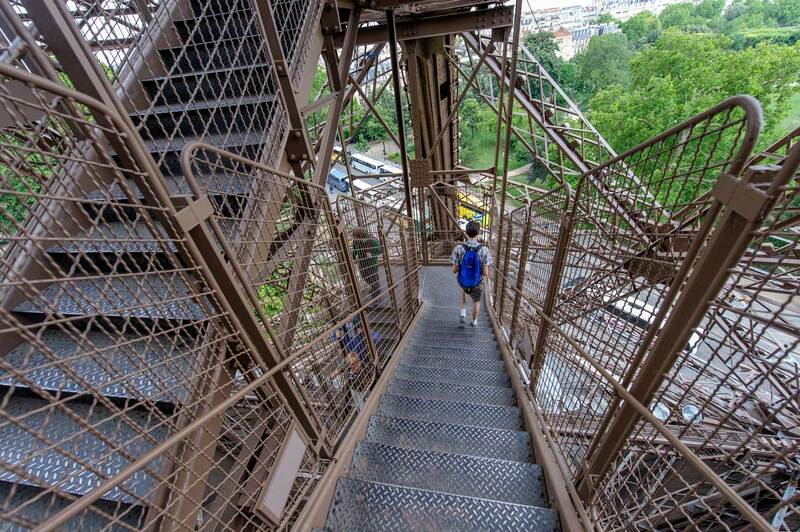 The Tour Eiffel Edgewater reminds us of Ivar – twice. 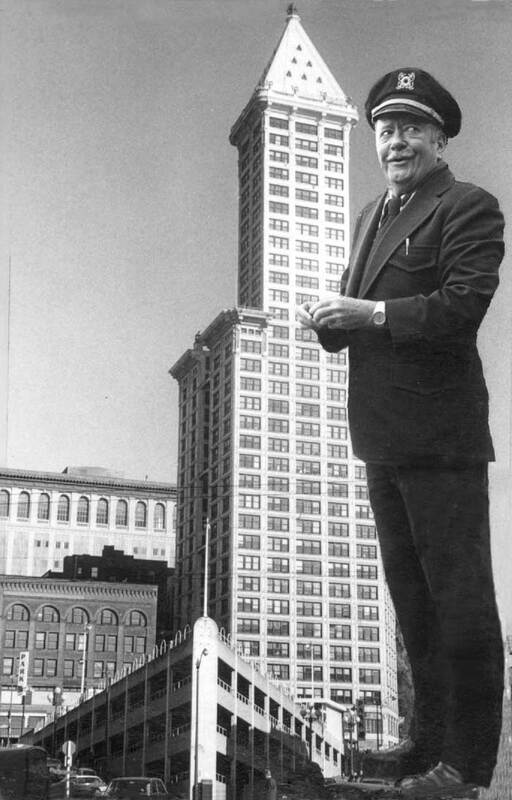 First, of course, his valiant attempts to prepare for Trans-Sound Submarine Commuting (TSSC) with underwater billboards promoting his ever-rejuvenating clam chowder, and second, of course, for his daring-do to fly a salmon-sock from the top of what he described as his “last toy,” the Smith Tower, aka the Ivary Tower. 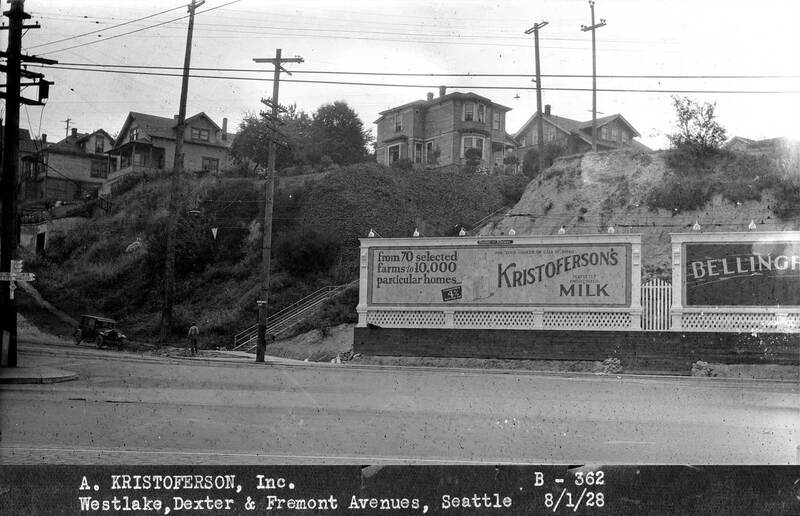 The Foster & Kleiser billboard at the meeting of Westlake, Dexter and Fremont Avenues in August 1928, showing here art for Kristoferson’s Milk. 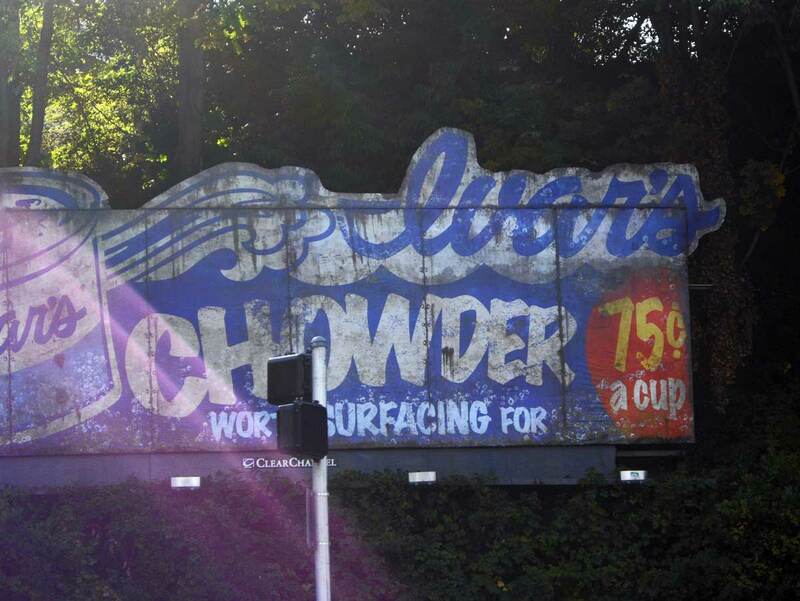 Ivar’s – well not actually Ivar but something very much like him, Ivar Inc. – surfaced underwater billboard displayed, again, at the intersection of Fremont, Dexter and Westlake Avenues, nearly 85 years after the milk and with increased or advanced nutrition in 2012 – or was it 2011 – or 10? 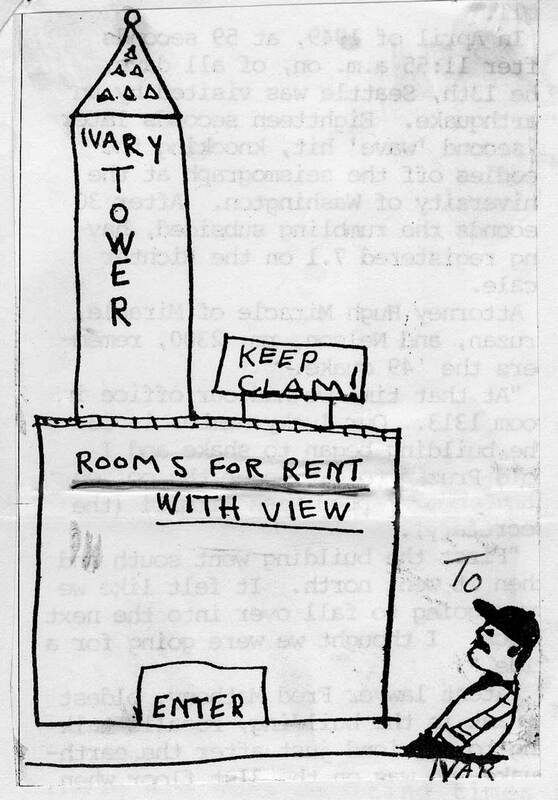 Ivar and his tower, one against the other – or with the other and over or upon and sticking his foot against the Sinking Ship Garage.